Bar Nine Collective welcomes the LATNT! If you haven't been to Los Angeles recently, or even if you have you may not have noticed, but the LA coffee scene is something to behold. 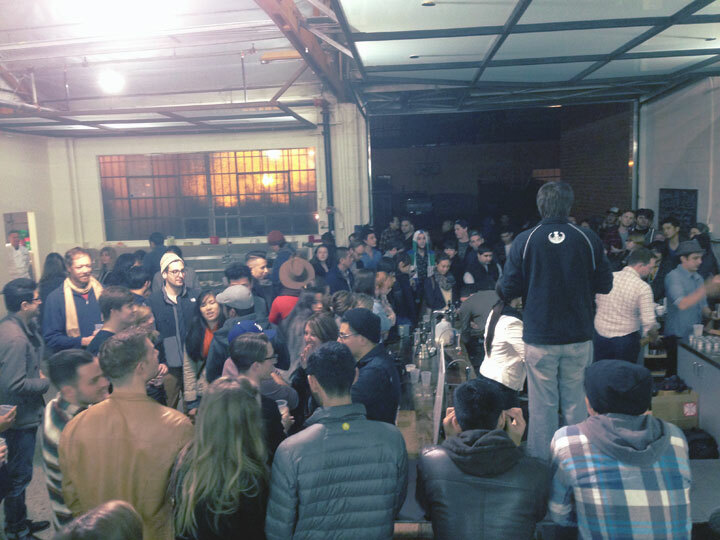 Baristas are better than ever, recently thumping San Francisco baristas to take the California Latte Art crown. New roasters, such as the beautifully designed Bar Nine Collective, are popping up almost as often as breweries are in San Diego. More and more coffee themed events are taking place in Tinseltown, headlined by the Big Western Event in February. 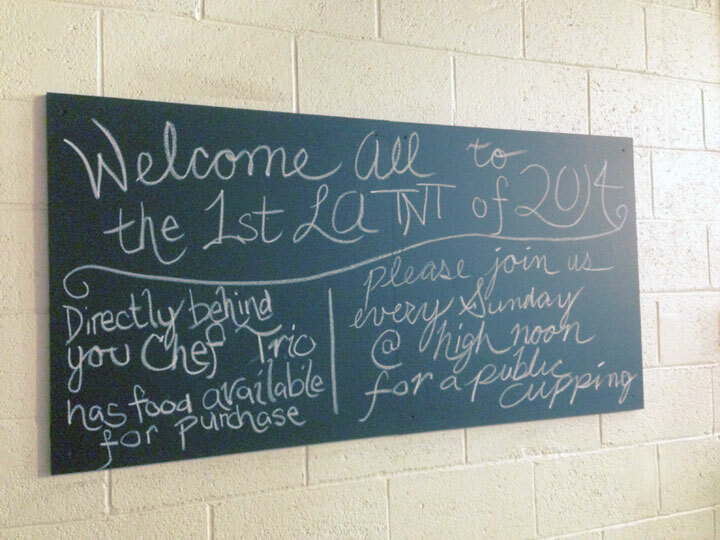 Last Thursday, I competed in the Los Angeles TNT Kickoff Event at Bar Nine Collective, a new roaster just weeks away from opening. 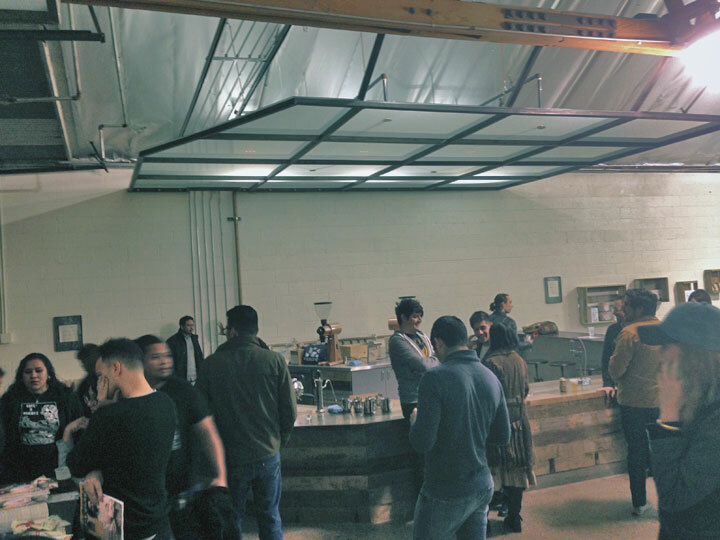 The space is gorgeous, with a reclaimed wood bar housing an under-the-counter espresso machine known as a Modbar. The problem of a bulky espresso machine hindering the barista-customer interaction is a non-factor, as only two slender groupheads and two steam wands are exposed. After a small cupping of some sampled roasted coffee, including an interestingly delicious Colombian, baristas from as far as Santa Cruz and Portland started trickling in. I threw my name in and watched as 52(!) baristas signed up to throw down, A new format was explained: baristas were allowed to choose their own designs each round, but were required to pour into different sized cups, starting with a 5 oz. cappuccino. As the bracket was unveiled, I found my name sitting in the first bracket. Todd Goldsworthy, the organizer of the LATNTs and all around fun coffee guy from Klatch Coffee, announced the prizes, including the grand prize of a trip to the BGA's Barista Camp in October. As a two time attendee, I can attest this is a huge prize. Packed house waiting for the TNT to start. As I stepped up to the machine to get the competition rolling, I'll admit it, I got a little nervous. Even though I do this for a living, pouring in front of some of the industry's best can be daunting. We were pouring into a 5 oz. cup, so I kept it clean and simple and poured a decent tulip-rosetta combo. I glanced over and saw my opponent went with a four-tiered tulip. After the "three-two-one!" they pointed to mine and I advanced to the macchiato round. Close decision, but I advance (my pour is on the left)! After mingling and catching up with people I hadn't seen in a while, round one ended and I was back up, pouring first to kick off round two. Macchiato cups are tiny, so the margin for error is slim to none. Unfortunately, I dumped too much off before pouring, leaving my milk a little thin. I tried to pour a simple winged heart, but it came out muddled and uneven. My competitor poured a nice tulip and the judges picked his to move on. I didn't get a chance to snap a picture of it, but trust me, his was better. I hung around for a bit, watching as barista after barista stepped up and poured amazing designs. I left before it ended (in my defense I did have to open the next morning and still had a two hour drive home), but Ryan Jiang from Andante Coffee Roasting beat out Zayde Idontknowhislastname from the host Bar Nine Collective. It was a great night of friendly competition and I can't wait for the next one! P.S. I'm no photographer, so if my pictures aren't enough, check out the LATNTs album here. The filled our bracket. Congratulations to Ryan from Andante!